Following the massive success that last year's Black Panther was met with, its inevitable sequel Black Panther 2 certainly has a lot to live up to, particularly in the villain department. Killmonger ended up being one of the most fantastic supervillains to ever make their way to the big screen, and was arguably a large part of why Black Panther received an Oscar nomination for Best Picture. Whoever the Black Panther 2 villain ends up being certainly has some big shoes to fill, not just due to Killmonger's role in last year's movie, but also due to their roles in the comics. Black Panther's three most prominent villains from the comics, Killmonger, Man-Ape and Klaw, have all already appeared in the first movie, with two of them dying and the other becoming a hero at the end. Whoever Marvel decides should take up the villain role in Black Panther 2 will more than likely end up being a secondary villain from the comics at most. With this in mind, here are 10 villains we want to see in Black Panther 2. In the comics, Salamander K'Ruel was one of Killmonger's most trusted agents in his original attempt to take control of Wakanda by overthrowing T'Challa. K'Ruel's primary weapon was a bow and arrow with explosive arrows, which made himself one of Killmonger's most useful allies and one of T'Challa's most formidable foes. He also had Vibranium inside of him (similarly to Wolverine), which gave him a stronger physique, but also made him look grotesque with large thorns and blisters protruding from his skin. While Salamander K'Ruel never really was a stand-alone villain, it would be great to see him make an appearance in Black Panther 2, perhaps as a post-Killmonger sympathizer that still believes T'Challa is unfit to be king, or even as a cronie for whoever the main villains ends up being. The shape-shifting Marvel villains, the Skrulls, are making their debut in the Marvel Cinematic Universe this year in Captain Marvel, and it is widely believed that they will become a big part of the MCU going into Phase 4. With this in mind, it would be great to see Black Panther go against these alien creatures, especially given his history with these villains in the comics. During a brief period where T'Challa was absent from Wakanda in the comics, the Skrulls infiltrated Wakanda as part of their Secret Invasion. However, upon his return, Black Panther already knew about the Skrulls and managed to weed out the first wave of intruders with ease. When the Skrull General arrived in Wakanda with his army to finish their planned take-over, he was greeted by the heads of numerous Skrulls on stakes with a sign saying "See Wakanda and Die." Black Panther quickly studied the physical features of the Skrulls, including their mannerisms and weaknesses, and managed to infiltrate the Skrulls by posing as one of them. It truly showed how great of a warrior Black Panther is, combining strength and science, and it would be great to see this arc from the comics on the big screen. In the comics, Hector Ruiz started as a young man growing up in New York City, after being born in the Dominican Republic. He became incredibly involved with New York gangs, before becoming an armed robber on his own. He soon got his hands on an advanced version of Falcon's wings, gifted to him from the group known as the Dragon Circle. While we've already had a villain with mechanical wings as a villain in the MCU (Vulture in Spider-Man: Homecoming), it would still be great to see Windeagle show up in Black Panther 2. Windeagle's interaction with Black Panther was treated like a crime/mystery drama, which would add a great twist to the movie, making it truly stand out from last year's Black Panther. Tilda Johnson has a history a bit like Killmonger's, being stuck in the ghettos of America and becoming a skilled fighter / criminal in order to make her way out. She soon went by the name Nightshade. Nightshade is actually quite reminiscent of Shuri, as she is practically a supergenius, being incredibly knowledgeable at genetics, cybernetics and physics, which always gave her an advantage in a fight. Nightshade has such a rich history in Marvel Comics that she genuinely feels like the most likely comic-book villain to appear in Black Panther 2. While Killmonger could take on T'Challa physically, he was defeated by T'Challa's knowledge of science. Nightshade is powerful in both physical and mental strength, which could make her Black Panther's greatest foe yet. It should be noted that Killmonger's girlfriend at the beginning of Black Panther was hinted to be Nightshade, but there was no mention of it in the movie, meaning that this character is still technically available for future movies. Namor isn't always depicted as a villain, but he almost always is depicted as one when he appears in Black Panther comics. Namor is essentially Marvel's version of Aquaman, seeing as the idea for Aquaman was actually taken from Marvel when they introduced Namor. Since they are both kings with great pride in their nations, Namor and T'Challa are almost always at opposition with each other. They have a horrible history together in the comics and would often refuse to help a cause if they learned that the other person was also helping the cause. It would be great to see Namor introduced to the MCU in Black Panther 2 to establish this conflict between the two kings right off the bat, and possibly set up more struggles between the two monarchs down the road. In the comics, Black Panther would occasionally find himself pinned against the KKK. Much like what Marvel did with the Nazis, the comic-book KKK was led by a red-themed, super-powered villain, known as the Soul-Strangler. The KKK are primarily based in America in Marvel Comics, but they have been known to specifically target Wakanda. Black Panther 2 would hypothetically have a way to introduce this conflict, seeing as the first movie ended with T'Challa starting a number of inner-city reach-out centers across the United States, which would surely irritate this terrorist group. If Marvel could handle it well, the KKK would be great antagonists in the Black Panther sequel. It would be fantastic if the movie simply opened up with Black Panther kicking the crap out of the KKK, just to properly set the tone of the movie. Kiber the Cruel is among Marvel's most peculiar villains. Like many supervillains, Dr. Kiber started as a mad scientist, eventually secluding himself to a lab on a mountain, where he was assisted by his androids in his work. In a lab experiment, Kiber's physical being was bonded with the floor of the lab, making him unable to leave the area, leaving him living in absolute pain. Kiber soon learned how to project himself around the world, essentially creating powerful dopplegangers of himself that would kidnap people (with the help of his androids). He then found a way to absorb these people into himself in order to make himself and his projection stronger. Kiber the Cruel almost always found himself faced off against Black Panther, making Black Panther 2 the perfect place to introduce this unique supervillain. Changamire isn't a supervillain like the rest of the villains on this list. He doesn't have any specific powers or evil intent, yet has done more harm to T'Challa than arguably any other villain. Changamire is actually a Wakandan philosopher who was the tutor for the King T'Chaka's royal court, before he was exiled for being anti-monarchical. In exile, Changamire became a revolutionary professor, urging countless members of Wakandan society to try to take over the country and dethrone Black Panther. Last year's Black Panther was driven by an ethical narrative, so it's likely that Black Panther 2 will follow suit. Introducing Changamire would be the perfect way to do this, with this philosopher being practically a mentor figure for whoever the next supervillain ends up being. The end of Black Panther already showed that Wakanda is practically on the brink of Civil War, with much of the border tribe abandoning the country. Introducing Changamire as a wise philosopher who opposes everything T'Challa says could be enough to snap the tension in Wakanda and bring the country into an all-out war. Now that 20th Century Fox is about to be acquired by Disney, Marvel Studios has the chance to do something that no movie studio has ever managed to do before: give Doctor Doom some on-screen justice. The three previous takes at the Fantastic Four all failed at depicting Doctor Doom as the booming, intimidating, in-depth villain that he is in the comics, so hopefully Marvel can get it right. Perhaps the best way to give Doctor Doom a great introduction isn't through the Fantastic Four, as the previous movies have tried, but instead having him show up as a villian in Black Panther 2. In the comics, Doctor Doom's greatest attribute was perhaps the fact that he had his own country, Latveria. Much like Namor, Doctor Doom's monarch status often put him at odds with Black Panther. When Doom learned about the Vibranium being stored in Wakanda, he essentially started a war between the two countries, desperate to get his hands on the metal. 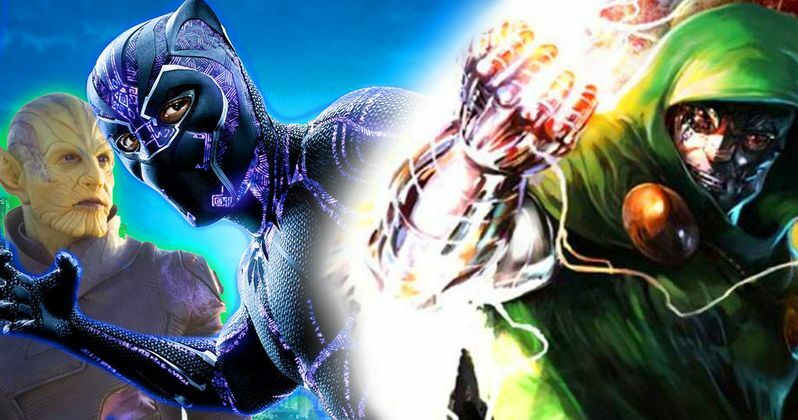 Whether they use this specific arc from Marvel Comics or something else entirely, it would be great to see Black Panther and Doctor Doom face off at some point in the MCU.